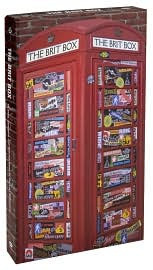 A new thing I just discovered today is a collection of British rock called The Britbox. The box contains music from the Smiths, the Verve, and some of the best Britpop from the '80s and '90s. Other bands featured in this collection are Pulp, the Cure, Cocteau Twins, Oasis, Blur, Stereolab, etc. The Britbox contains music from a total of 78 British performers and it is bound to prove educational for those interested in music. so, are the 4-cd's sort of like mix cd's since there are a total of 78 performers included in the project? it would make a good holiday present. Right. A CD mix would be a good metaphor. where does not get it? is this an online offer? You mean, where it could be found? Perhaps places like Barnes&Noble or Borders? Of course, it can be purchased online, that's how I came to know about it. Try either Amazon or B&N.